How to Use FanGraphs: Leaderboards! In addition to updated glossary entries and blog posts extolling the virtues of various sabermetric statistics and principles, the revitalized FanGraphs Library is also going to be a place where we highlight features available at the site that will allow you to get the most out of our data. Below, you’ll find everything you ever wanted to know about the FanGraphs Leaderboards. If you’ve been a long-time reader who never misses a single post, a lot of this might be old news. If you’re anything short of that, there’s a good chance you’ll pick up a few tricks to get the most out of the site. To navigate to the leaderboards, go the tab at the top of the page that says “Leaders” and click on the current year (or whichever year you’re interested in for hitters or pitchers). We’ll use 2014 hitters as an example. If you’ve clicked your way to the right page, the top of your screen should look like this. Below the basic toolbar, you’ll find three tabs called “Player Stats,” “Team Stats,” and “League Stats.” Clicking on the player section will return individual results by player, clicking on the team section will return individual results by team, and clicking on the league section will return results of the entire league. This might seem self explanatory, but if you ever wanted to know what the league average value is for a given stat, this is the way to do it. The next row down offers you a chance to switch between “Batting,” “Pitching,” and “Fielding.” This is also going to be pretty self explanatory, but figuring out how to navigate quickly from one area to another is important. Below that is where things start to get interesting. You can select which league you want to view, either the AL, NL, or All Leagues. Next to that, you have the option of selecting an individual team. Beyond that, you can “Split Teams” which allows you to divide up a player’s season or career based on the teams for which he played. For example, if you want to view Joakim Soria’s season with the Royals and Tigers separately, clicking Split Teams would divide those into separate lines. If you are looking at multi-season data, Split Teams will offer you different lines for each player-team relationship. Also on this line is a check box for “Active Roster,” which allows you to grab players who are currently on a 40-man roster. Next there is a row where you can select one of many positions. This is sometimes confusing, but these tabs allow you to return players who play these positions. These tabs do not provide you with their production only while playing these positions. For example, Nelson Cruz might show up in both DH and OF, but both tabs will include his full season stats. This is true for team and league data as well. On the next line, you can select an individual season on the left and set your minimum PA on the right, but the “Split” tab is where things get interesting. I won’t list all of the options but we allow you to split by time of year, date, handedness, home/away, type of hit, situation, hit location, position (i.e. stats while playing SS), and batting order position. Take another step down and you can choose to split seasons, which would allow you to look for seasons from 2010-2014, for example, with each player’s season available individually. So you could get Roy Halladay’s 2010 and 2011 seasons in the same leaderboard. Next to that you can just take a look at all rookies. And then you can decide to set a range of seasons picking any starting and ending date. Take one more step down and you can set the ages you want to show up in the results, meaning that if you only want to see 30 year old players, you could set the minimum and maximum ages to 30. Below that, we have a panel that allows you to select from any number of statistical groupings. There are far too many stats to name in one post, but if you click through the tabs you’ll be able to see what we offer. If you scroll down the page you’ll see something close to the image above, although there will be 30 rows rather than the truncated 15 you see here. Each column is sortable, you can change the number of results you get per page, and you can jump around to the various pages of results. You can also make use of three important features. On the far right, above where it says “WAR,” there is a little tab that says “Export.” This is going to be an extremely useful tool if you like to play around with stats and do all sorts of crazy filtering, graphing, or combining. Clicking “Export” will provide you with a .CSV of whatever is currently in the leaderboard. So if you’ve decide to look at second basemen from 2012-2013 with 500 of more PA, clicking “Export” will download all of that data. You can then open it in Excel or Google Sheets and use it however you like. To the far left, you’ll find “Show Filter,” which will allow you to specify statistical values that you want to see. For example, you can ask it to show you the stats for players who have a walk rate of 8% or higher, for example. The filters don’t allow you to sort by every stat, so exporting and sorting yourself might be necessary in some cases. You’ll also notice “Custom Reports” is right next to this filtering tool, but this is going to just send you down to the part of the page below the actual data, so let’s just scroll down and see this: These three features are essentially the hidden gems of FanGraphs. 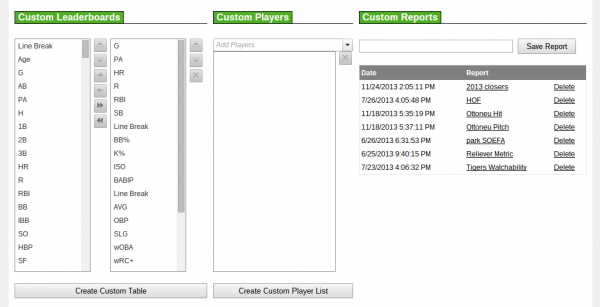 On the left, we have “Custom Leaderboards” which allow you to arrange the actual statistics in any order that you want. If you want to add RE24 to the Dashboard, all you have to do is find it in the left hand column, select it, click the left arrow and then click “Create Custom Table.” A new page will load with RE24 alongside the other stats. You can essentially customize this any way you like. Finally, you can save specific leaderboards on the far right. This might be a certain set of players, certain set of stats, or really anything you can imagine. If you’re logged in, give it a name and click “Save Report” and you can come back to it again and again. All of these features are useful individually, but you can really get a lot of value out of combining them in all sorts of ways. Want to see how two players did against lefties from 2010-2011? You can do that easily. Additionally, if you have a particular leaderboard you find interesting or useful, the URL is unique for everything, so you can copy and paste it to share with everyone. Mastering these features is will not only help you find the information you’re looking for, but you will also be much better at communicating your findings to others. Have fun playing with the various features and feel free to ask questions in the comments section if you can’t figure out how to do something! We hoped you liked reading How to Use FanGraphs: Leaderboards! by Neil Weinberg! I’m still not clear on a lot of this, but I’m going to seriously play around with these features in the hope I can use them in my writing. I tweeted to Jeff Sullivan the other day about these exact issues, and he was kind enough to give me some clues. I’ve had some real difficulty trying to use the site. It’s my job to help with this kind of thing, so let me know if I can be of assistance. Is there a way to compare stats between certain dates? For instance, if I wanted to see how a player did from June 20th through the beginning of the All-Star break, how, if possible, could I find this data? Or is there a different resource out there somewhere (not on FanGraphs) which provides this info? You can do this for individual players on FanGraphs. Go to the player page and click on game logs and then adjust the dates you would like. We don’t have a select a date feature on the leaderboards at this time. I can’t think of any site, off the top of my head, that will give you a leaderboard for a custom date rate. Baseball-Savant has it for a few things, but that’s about it. Website allows you to compare standard pitching or hitting stats for a custom time frame. I stumbled across (searched high and low) this website when I was wondering just how great Corey Kluber has been since April 24th. This works really great too! Thanks! As for your question, the answer is “really, really, super-de-dooper”. Any chance that we can get the sort column highlighted or shaded to show in a jiffy which column the particular table is sorted by? For instance I’ve learned over time that when I view pitching data that the default sort is FIP but sometimes it takes a bit to figure out the sort parameters on the tables. How do the custom filters work. What does ‘and’ & ‘or’ mean. I always just end up with a blank leaderboard. Any chance of a walkthrough example? Thanks Neil, that’s set me straight. It was the decimals that got me!! I kept putting in 10.00, 20.00 etc for K/BB% and wondered why I was getting nothing out. Is there any way to see a custom player list comprised only of today’s probable starters, short of putting each in manually? Great tool. Not before the fact. Once they all start pitching, you cant get their stats for the day by using the live-today split. Right, you want to use the “opposite” split and then look at FB and LD counts. How can salary information be included in a customized report? When I click on “customize” in the gray area, “salary” comes up as an option for both batters and pitchers, but I can’t figure out how to save the report filters. How can I see multiple splits? For example the last calendar year vs L? Unfortunately, that isn’t an option right now. Sorry. OK. Thank you for the very quick response. Yes. Multiple splits would be great (such as home vs. L), not just one or the other. Thank you for the reply Neil. I think I was trying to create a ‘custom team’, rather than creating it in ‘custom players’. Do I have to create the custom stat thing every time? Can’t I create a report that just displays the ones I want to see every day? Also, I can’t see LOB, FIP-, ERA- in the stat column in ‘custom leaderboards’. Any idea why I can’t see them? Think I might have worked it out. Depending if you are on ‘dashboard’, or ‘standard’, or ‘advanced’ etc, there are different stats to choose. I found all the ones I wanted under ‘dashboard’ … i think. I think it would be easier to have a section where you can import a pre-defined stat report. Bottom of the page, you can save reports! Yes, but you have to choose the stats you want EVERY time you create a report. For instance, I want to show AVG, OPS, and SB for all White sox vs Lefties, I have to create a report for white sox vs lefties and enter the stats i want for that report. I can’t just import a list of stats and apply it to that team. I have a list of about 20 stats i look at and its tedious to have to select them for every report i create. The split thing is tricky. Have to do the split, then customize, then save I think. Also, if I’m in a report and I change say the ‘split’ to show vs L, I lose the stats i want to see. It defaults back to what fangraphs wants me to see. Neil, is there a way to make a graph vs. time of a player’s SwStr% without having to export data into Excel? Can the fangraphs page itself do this? it would awesometabulous if Fangraphs had an option for “players”, “pitchers”, “teams”, etc., that were starting/rostered ONLY on TODAY’S date. (or on a particular day past,present and/or future.) then one could customize from that list. i see, so edit directly in url itself. great. one more question, i have already saved several customized charts. how can make it so i can use my customized charts to show “today’s roster” info from url i just created? You can’t, but you can look at “yesterday” and “live-today” in the split drop down if that helps at all. Won’t show you ahead of time though; which I assume is what you want. Maybe I am missing something obvious but is there a way to get all pitchers for a season but exclude any position players that got an inning or so in a mop-up situation? Thanks in advance for any help. No, you can exclude pitchers from the batting stats but not position players from pitching stats.